Although rain is generally a good thing, when storm water makes its way into the separate sewer system for Kansas City, Missouri, the impact can be devastating. Excess storm water creates an average of 6.4 billion gallons of wastewater overflow each year in Kansas City's more than 1,700 miles of sewer system. The city is one of more than 700 communities across the United States that must comply with regulatory standards for wet weather sewer overflows. In 2010, Kansas City entered into a federally mandated agreement with the United States Environmental Protection Agency (EPA) to reduce sewer overflows by investing in the city's aging sewer infrastructure over a 25-year period. Kansas City's $4.5 billion Overflow Control Program will capture and treat 88 percent of combined sewer flows and eliminate sanitary sewer overflows during heavy rainfall events. To leverage each dollar of the investment, Kansas City is asking homeowners to help reduce the overflow problem by voluntarily removing improper plumbing connections from the city's sewer mains. The program, called Keep Out the Rain KC, can help Kansas City save millions of dollars in future capital improvements. Kansas City adopted this targeted approach because private plumbing connections are believed to be responsible for more than half of the rainwater that enters the sewer system. "Our sewer system is designed to collect and convey wastewater to one of our six wastewater treatment plants," said Andy Shively, chief engineering officer for Kansas City Water Services. "When rainwater gets into the sewer system, it can overwhelm our pipes, which, in turn, can cause overflows and basement backups. Once rainwater enters the sewer system, it must be treated, driving up maintenance and treatment costs." "Kansas City is committed to achieving the requirements of the city's federally mandated consent decree in a way that improves neighborhoods and reduces program costs for our residents," said Shively. 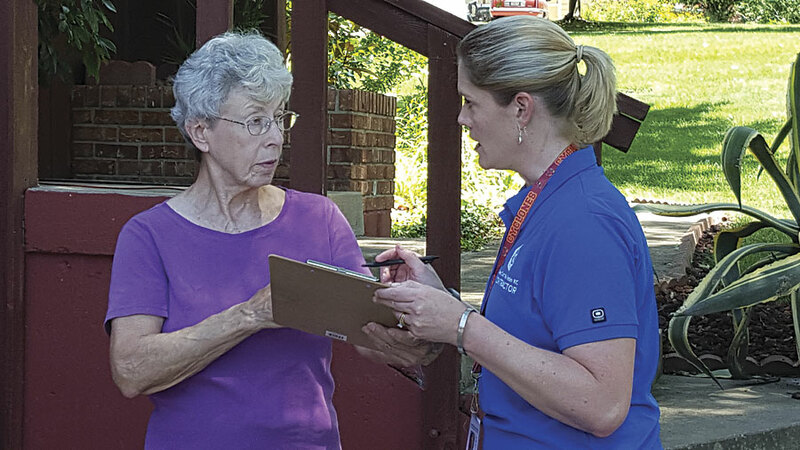 "ArcGIS is helping Kansas City to effectively manage the Keep Out the Rain program and report improvements to the Environmental Protection Agency and to our residents." To create the Keep Out the Rain KC program, Kansas City first turned to existing GIS data to pinpoint areas where wastewater from improper plumbing connections on private property might be entering the city's sewer mains. The city found 55,000 properties for which simple, cost-effective plumbing corrections could help make a big impact on reducing the city's overflow control issues. Those 55,000 properties with improper plumbing connections were located in an area of more than 300 square miles. To get a high level of voluntary participation in the program, the city needed to effectively communicate the value of the program to the public. To perform a thorough evaluation in the field, the city also needed to share a large amount of data to coordinate and track the work being done by a team of city staff members and contractors from many different organizations. Finally, the city needed to analyze the effectiveness of the program in achieving its goal of removing rainwater from specific portions of the sewer system. The ArcGIS platform is being used for public outreach, project coordination, data collection and sharing, and results analysis. ArcGIS has been used to generate targeted mailings, based on location, to property owners to get them to sign up for the program voluntarily. By embedding an interactive map in the program website, ArcGIS has also been used to help the members of the public determine if their properties are located in the program area and eligible. Using ArcGIS, the project area was subdivided into sections to more evenly distribute the work across the project teams and allow the results to be tracked for a much smaller area. The teams in the field performing property evaluations are using the Collector for ArcGIS app so they can have current information on the location, status, contact information for property owners, and the locations of wastewater and storm water infrastructure for each of their assigned properties. The app can also supply the location of smoke testing observations, which may indicate that there is an inflow [water entering the sewer from inappropriate connections] or infiltration [groundwater entering the sewer caused by defective pipe joints] source on the property. 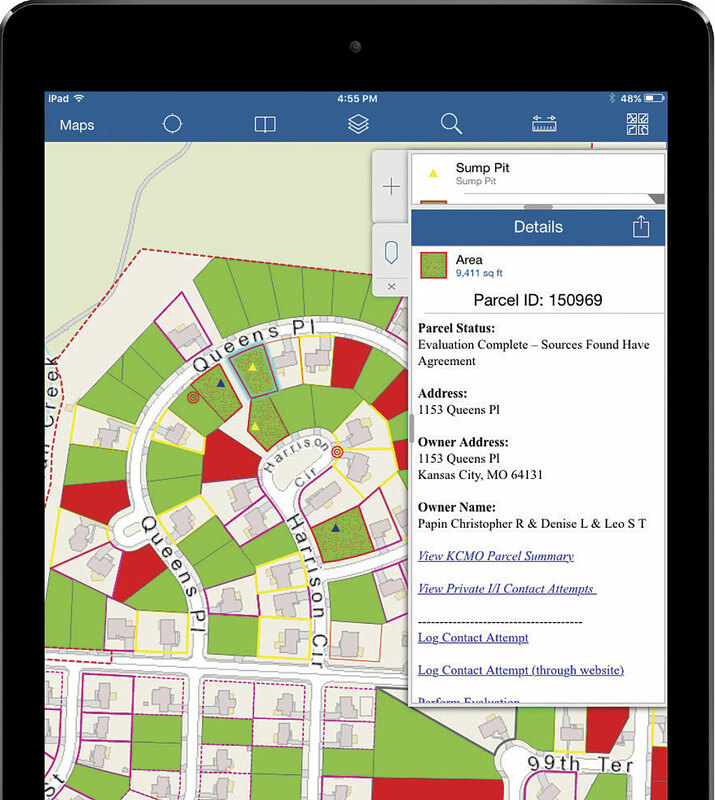 Collector for ArcGIS has also been integrated with smart digital forms built on the iFormBuilder platform developed by Esri partner Zerion software. This integration makes the process more efficient by eliminating the errors associated with manually entering property information. Once an evaluation is completed, the information is immediately available in ArcGIS Online and the Project Management Dashboard running in Microsoft Azure. Using ArcGIS mobile technology and ArcGIS Online allows the project team to see and analyze information in real time. The moment evaluation is completed, that information is available so the entire project team and all program stakeholders can analyze it using the online dashboard. That information is also available for on-demand reports that focus on the program's key performance indicators. Having access to information in real time allows the project team to be agile in its approach. Management is able to see what methods have been successful and capitalize on those while working to address any weaknesses. The richness of data being collected in the Keep Out the Rain KC program allows the team to continually improve upon the approaches being taken to accomplish project goals. To learn more about the Keep Out the Rain KC program and its ArcGIS implementation, contact Brian Hiller, technology implementation project manager at Burns & McDonnell.